Muir Woods National Monument is a unit of the National Park Service on the Pacific coast of southwestern Marin County, California, 12 miles (19 km) north of San Francisco and part of the Golden Gate National Recreation Area. It protects 559 acres (226 ha), of which 240 acres (97 ha) are old growth Coast Redwood (Sequoia sempervirens) forests, one of a few such stands remaining in the San Francisco Bay Area. The Monument is an old-growth coastal redwood forest. Due to its proximity to the Pacific Ocean, the forest is regularly shrouded in coastal fogs, contributing to a wet environment that encourages vigorous plant growth. The fog is also vital for the growth of the redwoods as they use moisture from the fog during the dry summer. The Monument is cool and moist year round with average daytime temperatures between 40 and 70 degrees Fahrenheit (4 to 21 °C). Rainfall is heavy during the winter and summers are almost completely dry with the exception of fog drip caused by the fog passing through the trees. Annual precipitation in the park ranges from 39.4 inches (1,000 mm) in the lower valley to 47.2 inches (1,200 mm) higher up in the mountain slopes. The redwoods grow on brown humus-rich loam which may be gravelly, stony or somewhat sandy. This soil has been assigned to the Centissima series, which is always found on sloping ground. It is well drained, moderately deep, and slightly to moderately acidic. It has developed from fine-grained sandstone and shale. More open areas of the park have shallow gravelly loam of the Barnabe series, or deep hard loam of the Cronkhite series. 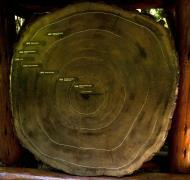 One hundred fifty million years ago ancestors of redwood and sequoia trees grew throughout the United States. Today, the Sequoia sempervirens can be found only in a narrow, cool coastal belt from Monterey to Oregon. Before the logging industry came to California, there were an estimated 2 million acres (8,000 km²) of old growth forest containing redwoods growing in a narrow strip along the coast. By the early 20th century, most of these forests had been cut down. Just north of the San Francisco Bay, one valley named Redwood Canyon remained uncut, mainly due to its relative inaccessibility. 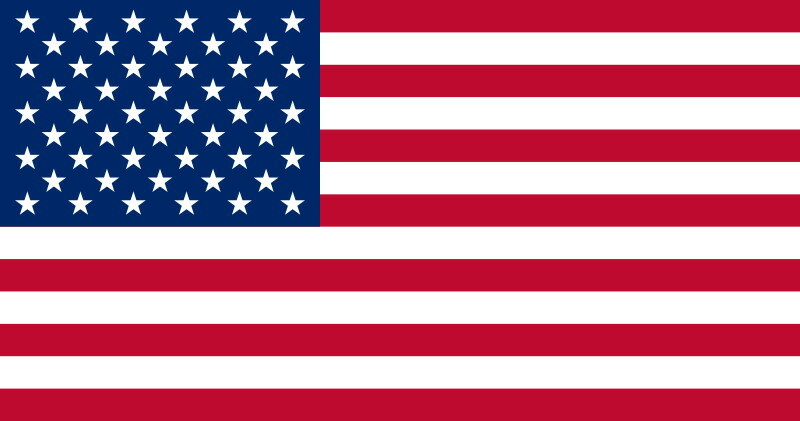 This was noticed by U.S. Congressman William Kent. He and his wife, Elizabeth Thacher Kent, purchased 611 acres (247 ha) of land from the Tamalpais Land and Water Company for $45,000 with the goal of protecting the redwoods and the mountain above them. In 1907, a water company in nearby Sausalito planned to dam Redwood Creek, thereby flooding the valley. When Kent objected to the plan, the water company took him to court to attempt to force the project to move ahead. Kent sidestepped the water company's plot by donating 295 acres (119 ha) of the redwood forest to the Federal Government, thus bypassing the local courts. MY DEAR MR. KENT: By George! you are right. Those are awfully good photos. In December 1928, the Kent Memorial was erected at the Kent Tree in Fern Canyon. This tree—a Douglas fir, not a redwood—was said to be Kent's favorite. Due to its height of 280 feet (85 m) and location on a slope, the tree leaned towards the valley for more than 100 years. According to Muir Woods Storms in El Niño years of 1981 and 1982 caused the tree to tilt even more and took out the top 40 feet (12 m) of the tree. During the winter of 2002–03, many storms brought high winds to Muir Woods causing the tree to lean so much that a fissure developed in January 2003. This fissure grew larger as the tree slowly leaned more and more, forcing the closure of some trails. On March 18, 2003 at around 8:28 pm, the tree fell with a thunderous boom, damaging several other trees nearby. The closed trails have since been reconfigured and reopened. In 1937, the Golden Gate Bridge was completed and park attendance tripled, reaching over 180,000. Muir Woods is one of the major tourist attractions of the San Francisco Bay Area, with 776,000 visitors in 2005. In the spring of 1945, delegates from 50 countries met in San Francisco to draft and sign the United Nations Charter. President Franklin Delano Roosevelt died on April 12, 1945, shortly before he was to have opened the United Nations Conference. On May 19, the delegates held a commemorative ceremony in tribute to his memory in Muir Woods' Cathedral Grove, where a dedication plaque was placed in his honor. The monument was listed on the National Register of Historic Places on January 9, 2008. The Coast Miwok were the original inhabitants of Marin County. Their largest villages were located at Bolinas Bay, Sausalito and San Rafael. These sites were convenient to estuaries where there was a dependable supply of seafood and to oak groves where the women could gather acorns. The Miwok also started fires to open up the forest. Since deer, elk and birdlife feed primarily on the kinds of vegetation which spring up after fires, this improved hunting. It is thought that seasonal habitations or hunting camps may have been at Big Lagoon (Muir Beach). Apparently, the native peoples avoided the dark redwood forests. 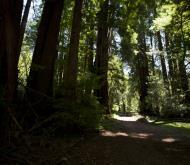 No Miwok artifacts have been found in Muir Woods. According to Miwok myth, a race of little people called "Sekah" lived in the redwood forest. They were believed to have the power to drive humans crazy. Spaniards were the first European settlers in Marin County, with the establishment of Mission San Rafael in December, 1817. Spanish settlement contributed to Marin culture, but had limited influence on the land but tremendous impact on the First Peoples, the Miwok. In 1838, William Richardson, an English immigrant, obtained the land grant Rancho Sausalito. This 19,571 acre tract included Sausalito, parts of Mill Valley, Mt. 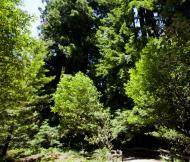 Tamalpais and Muir Woods. Few changes were made in land use. With the Gold Rush, a great flood of humanity needed timber, meat, crops and land. Blacktail deer populations diminished; elk and antelope, grizzly and black bear, cougar and coyote disappeared as meat and hide hunters swarmed over the country. Most Bay Area timber, including the accessible redwood stands of Marin County, was logged between 1840 and 1870. Redwood Canyon underwent little logging because of its inaccessibility until the 1950s when neighboring Kent Canyon was repeatedly logged. By 1890, local conservationists realized how vulnerable Redwood Canyon was to advancing civilization. William Kent, a Marin County resident, was urged to purchase the land. In 1905, the Kents, convinced of the woods value to the public as a preserve, purchased Redwood Canyon for $45,000. In 1907, the North Coast Water Company, successor to the Tamalpais Land and Water Company, started legal proceedings for a reservoir in Redwood Canyon. Kent realized the Antiquities Act of 1906 allowed the President, without the consent of Congress, to set aside land of scientific or historic value. He began efforts to donate the tract to the government. After frustrating delays, Kent's offer was accepted. Muir Woods, named in honor of conservationist John Muir, was proclaimed a National Monument on January 9, 1908. The North Coast Water Company suit was thrown out three years later. Travel increased slowly, but by 1913, 40,000 visitors each year were entering the woods. People wandered aimlessly and cars were unrestricted. 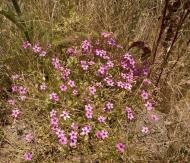 It became obvious that the fragile understory vegetation was disappearing. In 1924 cars were excluded from redwood groves, and trails were defined. As visitors multiplied, more restrictions were imposed in order to minimize damage to the land. Picnicking was eliminated; fences lined the more heavily used trails, and collecting of plants, animals, or rocks was prohibited. Gradually, small tracts of private land have been added to the Monument to eliminate incompatible uses. Grazing was eliminated from surrounding lands. Most of the nearby lands in the watershed were added to Mt. Tamalpais State Park or to the GGNRA for open space protection, recreational value and to protect the integrity of the watershed. Today, restoration work is in progress to rebuild the soil, revegetate trampled areas, remove non-native weeds, return the abundant biodiversity, revitalize the stream and rebuild populations of endangered species as well as remove un-necessary infrastructure and reduce noise. The star attraction of the Muir Woods is the Coast Redwood (Sequoia sempervirens). These relatives of the Giant Sequoia are known for their height. While redwoods can grow to nearly 380 feet (115 m), the tallest tree in the Muir Woods is 258 feet (79 m). Strangely, though, the trees come from a seed no bigger than that of a tomato's. The average age of the redwoods in the Monument are between 500 and 800 years old with the oldest being at least 1,200 years old. While overshadowed (and shaded) by their tall cousins, other tree species grow in the understory of the woods. Three of the most common are the California Bay Laurel, the Bigleaf Maple and the Tanoak. Each of these species has developed a unique adaptation to the low level of dappled sunlight that reached them through the redwoods growing overhead. The California Bay Laurel has a strong root system that allows the tree to lean towards openings in the canopy. The bigleaf maple, true to its name, has developed the largest leaf of any maple species allowing it to capture more of the dim light. The tanoak has a unique internal leaf structure that enables it to make effective use of the light that filters through the canopy. Redwood Creek provides a critical spawning and rearing habitat for coho or silver salmon (Oncorhynchus kisutch), coastal cutthroat (Oncorhynchus clarki clarki) and steelhead trout (Oncorhynchus mykiss), each of them threatened species. The creek is near the southernmost limit of coho habitat and the fish have never been stocked, so they have a distinctive DNA. The Redwood Creek salmon are Central Coast Coho Salmon which have been listed as federally threatened species since October 2006 and as federally endangered species in June 2005. Coho migrate from the ocean back to freshwater for a single chance at reproduction, generally after two years in the ocean. The spawning migrations begin after heavy latefall or winter rains breach the sandbar at Muir Beach allowing the fish to move upstream (usually in December and January). No salmon were seen in the 2007–2008 winter run, nor the 2008–2009 winter run. Evidence points to exhaustion of smolt oversummering in the creek due to a loss of large woody debris and deep pools where young salmon can rest. Starting in 2009, the National Park Service began restoring Muir Beach to create a functional, self-sustaining ecosystem and improve visitor access. The intervention was almost too late, since the coho only has a three year life span. Fortunately, as of January, 2010, and for the first time in three years, an estimated 45 Coho swam up Redwood Creek to spawn, creating 23 redds or clusters of eggs. In 2011, 11 live adult coho and 1 coho carcass was observed, along with three redds, a modest increase over the 2007-2008 spawning season. Statewide the coho population is 1% of its levels in the 1940s and the fish have vanished from 90% of the streams they formerly visited. Muir Woods is home to over 50 species of birds. This relatively low number is due to the lack of insects. The tannin in the trees repels the insects and the volume of flowers and fruits produced by plants below the canopy is limited by the shade of the redwoods. It is occasionally possible to see Northern Spotted Owls or pileated woodpeckers in the forest. While decreasing in numbers elsewhere, the Spotted Owls appear to be thriving in the Monument and other evergreen forests in the area. A National Park Service monitoring project of the owls is ongoing within the Monument. The project has found that adult owls are finding mates, raising young to adulthood and the young are having new broods of their own. The Monument is home to a variety of mammals ranging in size from the American Shrew Mole to much larger deer. The majority of the mammals are not seen as they are nocturnal or are burrowing animals living under the ground or the dense litter on the forest floor. Most commonly seen are Sonoma chipmunks, and Western gray squirrels. Bears historically roamed the area but were largely exterminated by habitat destruction. In 2003 a male black bear was spotted wandering in various areas of Marin County, including Muir Woods. There are 11 species of bats that call the Monument home, often using hollows burned into the redwoods by past fires as a maternity colony. In November, 2010 Sea otter (Enhydra lutris) have been spotted swimming in the new stream channel constructed in the lagoon area of Redwood Creek. Muir Woods, part of the Golden Gate National Recreation Area, is a park which caters to pedestrians, as parking of vehicles is only allowed at the very entrance. Hiking trails vary in the level of difficulty and distance. Picnicking, camping and pets are not permitted. There are no camping or lodging facilities in the Muir Woods. The Monument is a day-use area only. There are camping facilities in the adjacent Mount Tamalpais State Park. Visitors Center with permanent and changing exhibits. Also contains a gift shop. The monument has a number of paved walking trails (Trail Map) where visitors can get a close look at the magnificent giants. Other unpaved walking trails lead up the hills to connect with trails outside of the Monument boundaries. Bicycles are only allowed on fire roads. The annual Dipsea Race, a footrace which goes between Mill Valley and Stinson Beach, passes through Muir Woods on the second Sunday in June. The Double Dipsea, later in June and the Quad Dipsea, in November, follow the same course. Ranger-led walks on a number of different topics, including discussions on the watershed, wildflowers, and tidepools are held on weekends. Moonlight walks are held on nights with a full moon. Reservations are required for the moonlight walks. Special events are held for the summer and winter solstices. Weddings are allowed in the Monument with a proper permit. "Muir Woods Tour Manual – 2008". National Park Service. Retrieved 2009-01-19. Bolsinger, Charles L.; Waddell, Karen L. (1993). Area of old-growth forests in California, Oregon, and Washington. United States Forest Service, Pacific Northwest Research Station. Resource Bulletin PNW-RB-197. "National Register Information System". National Register of Historic Places. National Park Service. 2009-03-13. (2008) Long-term coho salmon and steelhead trout monitoring in coastal Marin County 2007: annual monitoring progress report. Natural Resource Technical Report NPS/SFAN/NRTR—2009/269. Fort Collins, Colorado: National Park Service. (Report). Retrieved Jan. 5, 2010. Michelle O'Herron (August 2009). "Coho Salmon Monitoring in Redwood Creek, Inventory and Monitoring Program Research Project Summary". National Park Service. Retrieved Jan. 5, 2009.
a b Peter Fimrite (2010-11-12). "Marin creek being restored to bring back coho". San Francisco Chronicle. Retrieved 2010-11-14. [www.sfnps.org/download_product/2428/0 2010-2011 Coho and Steelhead Spawner Survey Summary]. National Park Service. (Report). Retrieved 2011-05-15. Mark Prado (Jan. 2, 2010). "Marin's coho salmon on the brink of extinction". Marin Independent Journal. Retrieved Jan. 12, 2010. Donna Whitmarsh (Jan. 2010). "California Coho Salmon In Dire Straits, New Report Predicts Collapse". Bay Nature. Retrieved Jan. 12, 2010. The Birds of Muir Woods National Monument. Muir Woods National Monument – Birds, U.S. National Park Service. Last updated on September 2001. Accessed 2010-08-09. Muir Woods National Monument (Official Map & Guide). National Parks Service. Retrieved 2010-06-29.